The finished worked area is 5 by 7 inches. I purchased two of these kits from Ms. Holzberger web site. Kit included instructions, printed fabric, stump work fabric and wire for the stump work (sepals, leaf and butterfly). 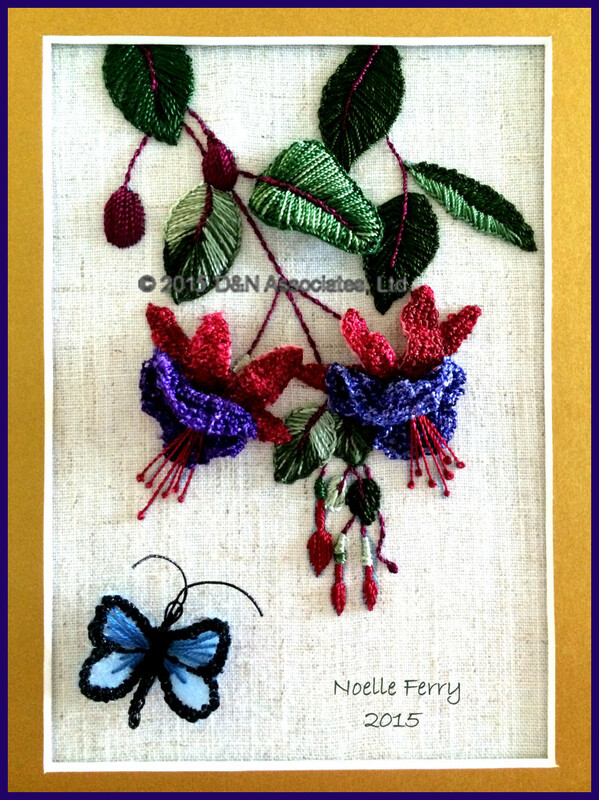 The first kit I stitched for my sister using the suggested Ed Mar Iris red thread for the sepals and white Iris threads for the petals. On this one that I have posted here today on SF, worked for myself, I did red sepals and two different shades of (Ed Mar) purple. The petals for the left flower is done in solid purple and the petals for the right flower is done in a variegated med to dark purple. Ms. Holzberger’s instructions suggested black Ed Mar Glory thread for the butterfly but I decided to use the thicker Kreinik Metallic #8 fine braid in black for the buttonhole (to secure the wire) stitching around the edge of the butterfly. 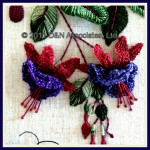 I used the same #8 braid for the body for the butterfly. The blue straight stitches on the wings are two strands each of Kreinik #5013A Silk Mori.